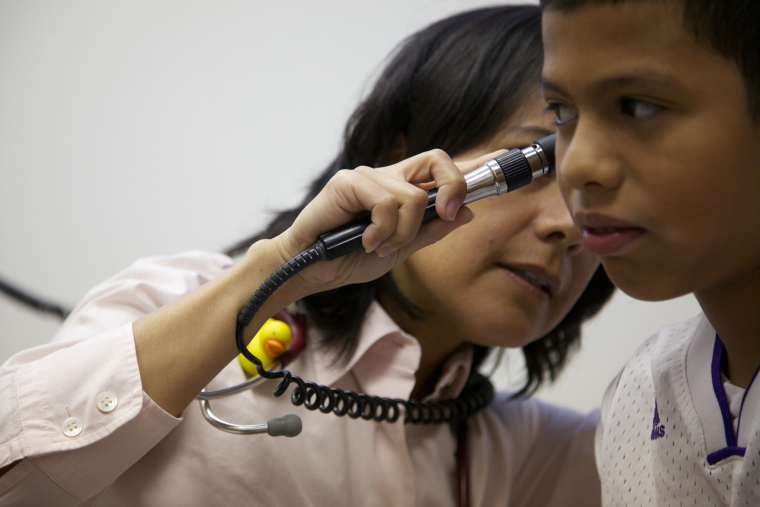 A doctor checks on a young patient. Health care professionals and service providers are building partnerships to help ensure that all families -- including those who experience homelessness -- get access to the care they need. Image courtesy Building Changes via Seattle University School of Theology & Ministry. This is an excerpt of a post from Seattle University’s School of Theology and Ministry. Read the full post,”Forging New Partnerships in Family Homelessness and Health,” on their blog. Imagine living and sleeping day after day in your car in 90 degree heat, shuttling your daughter to and from work and trying to get yourself to dialysis three times per week. This is the situation Lana and her 23-year-old daughter Rachel found themselves in this summer. Mother and daughter were evicted from their two-bedroom apartment in Renton last year when Lana’s kidneys failed and she could no longer work to keep up on rent. Like many families, they opted to hold on to their vehicle and the little bit of security and freedom it still offers them; they can keep their stuff relatively safe, and get to appointments and work more easily than if they were living at a shelter. Lana and Rachel are just one of several families and individuals profiled in Real Change’s ongoing series on vehicle residents in Seattle (see the July 22 article “Nowhere to Go” and the July 29 article “The Long Road Home”). “Bangarang Village,” the vehicle resident community Lana and Rachel joined earlier in the summer, included a pregnant single soon-to-be-mom suffering from arthritis, a couple with a baby on the way, a mentally and physically disabled Vietnam War veteran, and a mentally ill deaf man, among others. The group had banded together for security and community in a city that has very limited affordable housing and limited shelter, as well as a slew of regulations and scant options for those trying to get by living in their vehicles. All this to state the obvious: Those without a stable place to call home – whether they’re living in their vehicle, in a shelter, on the street, or couchsurfing from place to place – are vulnerable and often have health conditions (physical and/or mental) that are either brought on or exacerbated by their situation. Some may become homeless because of a health crisis, as Lana did. On the Seattle University Faith & Family Homelessness Project blog, Anna Markee, Senior Manager at Building Changes, discusses the intersections of homelessness and health, and offers ideas and hope for new kinds of collaboration and ways to help.